Offering an outdoor pool and water sports facilities Coronado Inn is situated on Coronado Island 1.7 km from San Diego Convention Center. Free WiFi is available throughout the property. Free private parking is offered on site. A free daily continental breakfast is provided. All rooms come with a flat-screen TV with cable channels. Select rooms at the property feature a seating area where you can relax. The private bathrooms include free toiletries and a hairdryer. There is a 24-hour front desk at the property. Guests can hire bicycles to explore downtown Coronado and the local beach areas. 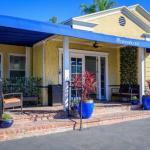 Downtown San Diego is 2.3 km from Coronado Inn while Balboa Park is 5 km from the property. San Diego International Airport is 5 km away.